To meet the Standard Class specifications of OSTIV - the Organisation Scientifique et Technique Internationale du Vol a Voile - R.E. 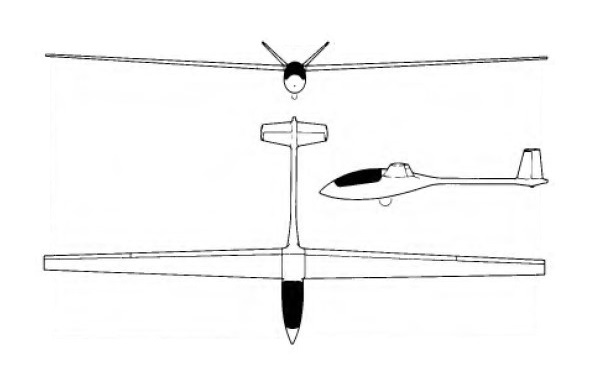 Schreder designed the 15m span RS-15 single-seater, which first flew in 1973 and is especially intended for simple and rapid assembly by homebuilders; it is licensed in the amateur-built Experimental category. No jigs are required, and most major components are prefabricated, thus reducing assembly time for a builder with no more than average mechanical aptitude to approximately 500 man-hours. The RS-15 is a pod-and-boom desgin which originally was intended to convert into various configurations, with wingspans of from 13 to 20 m. being matched with booms of suitable length, two-place pods, etc. In the event, Schreder decided to go with the basic 15 m. single-seat version featuring a fiberglass cockpit pod and a six-inch-diameter tube for the boom. The cantilever shoulder wings are all-metal except for polyurethane foam plastic ribs spaced at 4in intervals. The main-wing spar caps are machined from aluminium plate and up to 200lb of water ballast is carried inside the wing box spars. Plain ailerons are featured, and these can be linked to the optional trailing edge flaps/air brakes, which are of aluminium sheet bonded to foam ribs. The monocoque fuselage is built in two main parts: a prefabricated glassfibre forward pod, complete with bulkheads, floorboards and a moulded pilot's seat, and a 6in diameter tail boom of aluminium tube with an all-metal V-tail which can be folded upwards for towing or storage. The retractable monowheel has a hydraulic shockabsorber and brake, and there is a fixed steerable tailwheel, also with a shock-absorber. A number of significantly modified RS-15s have been built including Otto Zauner’s One Yankee with his own design of fuselage and tailplane.